To make this card I used the new “Spiral Die” which makes it so quick and easy to create beautiful roses. Crumb Cake card stock was used to make the base of the card, layered with Real Red Card Stock and another piece of Crumb Cake. This last layer of Crumb Cake card stock was cut with a Heart Framelit and then I ran it through the Big Shot with the exclusive Sale-a-Bration “Decorative Dots” Embossing Folder (free with qualifying orders!) and trimmed with the Scallop Border Punch. A piece of the new Fancy Foil Designer Vellum was glued to the back of the heart layer and then some Gold Bakers Twine was wrapped around and tied before I adhered the top layer to the card base with Stampin’ Dimensionals. A few sprigs of greenery and leaves were made with the Bird Builder Punch and Pisatchio Pudding and Old Olive Card stock. I think the XOXO is so sweet – this new stamp is from the “Quite the Pair” set and the “Love Ya” is from the “Express Yourself” Hostess Stamp Set. A pearl finished it all off! 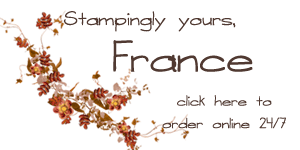 Get your free Stampin’ Up! products with qualified orders! Frenchie has a super project waiting for you over at my blog today too – click HERE to see what she created! I hope your Valentine’s Day is filled with love and sweet moments. Thank you so much for all your videos and your sharing. Today I cased the Valentine card above for my husband and I watched your video about the card in a box and made both the balloons and the butterflies. Used different dsp but made it like yours. Thanks again. You are the best!